The tee is a tiny tool, but it can pack a big punch when it comes to hitting the ball. Deciding on the right tee takes a little effort, but it’s nothing compared to the days of old when golfers prepared for their shots by mounding wet sand into a pile. In the late 1800s, many players were experimenting with cork, paper and rubber to make reusable tees. Some even applied for patents, but players were reluctant to break from the tradition of sand. It took an American dentist, William Lovell, to usher in the era of commercial tees in 1921. His “Reddy Tee” was made of wood and painted red so that it could easily be found in the grass. The design was sound, but it was his marketing savvy that finally broke through tradition. He hired two well-known golfers to use his tees in exhibition games. The rest, as they say, is history. The ideal height for you will depend on the club you are using. The standard size for a tee is 2 and 1/8”, but shorter and longer tees are permitted. The standard works well for irons, hybrid clubs and low-profile woods. The 4-inch tee is the maximum length allowed and is useful for taking advantage of the deep-faced drivers, which are so popular these days. To determine if you could benefit from more length, take a measurement. The center of the ball should be at the top of the club face when the club is resting on the ground. Many golfers find that the mid-sized tees, 2 ¾” and 3 ¼” are tall enough for their drivers, and can be easily pushed further into the ground when using their irons or hybrid clubs. 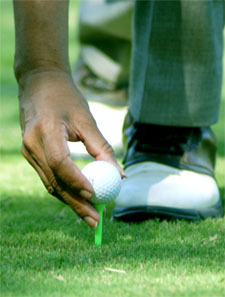 However, some players find it difficult to push a 4-inch tee that far into the ground, especially during winter play. So, having two different sizes on hand may be the best solution if you’re going to max out on length for your driver. Now that you’ve settled on size, how do you choose which material the tee should be made of? Like most topics concerning golf, people have very distinct preferences. And while the majority of golfers use wooden tees, there are plenty of players who swear by plastic. Wooden tees are cheap, plentiful (some courses give them away), are not as likely to bend and are biodegradable. The downside is that one can incur serious injury while trying to place a cracked wooden tee, and some players believe they don’t yield as much distance as a plastic tee. Plastic tees are more durable and may improve distances. In the “con” column for plastic: they take much longer to break down in the environment and the hardness of the material can scratch clubs and may damage lawnmowers (some clubs prohibit them). Not surprisingly, tees also come in a variety of other materials and designs. Zero Friction tees replace the traditional cradle top with a five-pronged holster that claims to minimize resistance and improve distance. Brush Tees feature a bed of soft bristles for the ball to rest on. The bristles bend easily reducing impact with the ball. Some golfers say it feels like they are hitting the ball mid-air. Concerned about the environment? Try tees made from wheat or corn. They are sustainable and break down quickly in an active organic environment.